DAMASCUS, Nov. 14 (Xinhua) — Syrian President Bashar al-Assad on Saturday condemned the terror attacks in Paris a day earlier, saying the French are suffering the same terror as the Syrians have been, according to the pan-Arab al-Mayadeen TV. “What France suffered from savage terror is what the Syrian people have been enduring for five years,” Assad reportedly said during his meeting on Saturday with a visiting delegation of French lawmakers, according to al-Mayadeen. France has been the target of terrorist attacks following its military offensive in Mali, Iraq and Syria. Its security system has been put at the highest level since the Charlie Hebdo series of attacks in January 2015. NOTE: The remnant of the American left has again fallen in with the official terror story of the Paris attacks, because the official story serves the left-wing’s denunciatory needs. I see that the Russians as well are on board with the official story as it serves their posture that we must all unite against terrorism. Amazing. Washington can rely on the world’s total blindness. Within one hour of the Paris attacks and without any evidence, the story was set in stone that the perpetrator was ISIL. This is the way propaganda works. When the West does it, it always succeeds, because the world is accustomed to following the lead of the West. I was amazed to see, for example, Russian news services helping to spread the official story of the Paris attacks despite Russia herself having suffered so often from planted false stories. Has the Russian media forgotten MH-17? The minute the story was reported that the Malaysian airliner was hit by a Russian missile over eastern Ukraine in the hands of separatists, the blame was ascribed to Russia. And that is where the blame remains despite the absence of evidence. Has the Russian media also forgotten the “Russian invasion of Ukraine”? This preposterous story is accepted everywhere in the West as gospel. Has the Russian media forgot about the book by the German newspaper editor who wrote that every European journalist of consequence was an asset of the CIA? careful about explanations that originate in the West. So now we have what is likely to be another false story set in stone. Just as a few Saudis with box cutters outwitted the entire US national security state, ISIL managed to acquire unacquirable weapons and outwit French intelligence while organizing a series of attacks in Paris. Why did ISIL do this? Blowback for France’s small role in Washington’s Middle East violence? Why not the US instead? Or was ISIL’s purpose to have the flow of refugees into Europe blocked by closed borders? Does ISIL really want to keep all of its opponents in Syria and Iraq when instead it can drive them out to Europe? Why have to kill or control millions of people by preventing their flight? Don’t expect any explanations or questions from the media about the story that is set in stone. The threat to the European political establishment is not ISIL. The threats are the rising anti-EU, anti-immigrant political parties: Pegida in Germany, the UK Independence Party, and the National Front in France. The latest poll shows the National Front’s Marine Le Pen leading as the likely French president. Something had to be done about the hordes of refugees from Washington’s wars, or the establishment political parties faced defeat at the hands of political parties that are also unfriendly to Europe’s subservience to Washington. EU rules about refugees and immigrants and Germany’s acceptance of one million of the refugees, together with heavy criticism of those governments in Eastern Europe that wanted to put up fences to keep out the refugees, made closing borders impossible. With the Paris terror attacks, what was impossible became possible, and the President of France immediately announced the closing of France’s borders. The border closings will spread. The main issue of the rising dissident political parties will be defused. The EU will be safe, and so will Washington’s sovereignty over Europe. Whether or not the Paris attacks were a false flag operation for the purpose of obtaining these results, these results are the consequences of the attacks. These results serve the interests of the European political establishment and Washington. so easily deceive French intelligence? Indeed, can French intelligence be intelligent? Can Western peoples be intelligent to fall for a story set in stone prior to any evidence? In the West, facts are created by self-serving statements from governments. Investigation is not part of the process. When 90 percent of the US media is owned by six mega-corporations, it cannot be any different. As The Matrix grows in the absurdity of its claims, it nevertheless manages to become even more invulnerable. 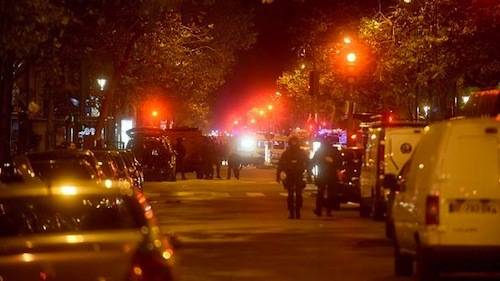 Another Paris False Flag Attack? A president of Italy revealed the truth about Operation Gladio, and you can read the sordid detail in a number of books and online. The bombings were not done, as was widely reported in the corrupt Western media, by communists. The bombings were done by Italian intelligence aided by the CIA. In one of the Italian investigatory hearings, a member of Italian intelligence said that the sites to be bombed were chosen in order to maximize the deaths of women and children, because these victims were most useful in discrediting the communists. Considering the Western World’s long tradition of false flag orchestrations, the “terrorist attacks” in Paris could be the most recent manifestation.